My third Parents as Teachers Kickoff Party! Today was Nathan’s last day of swim class, so after I dropped him off at the YMCA (with Daddy), I headed over to the preschool to take Autumn to my third (and her first) Parents as Teachers kickoff party! I have taken Nathan the last two years and he has always loved it, each year we always seem to get BEAUTIFUL weather as well! They do a different theme each year (last years was Meet Your Neighbors) and this year they did a birthday party theme. The “big kid” stuff was outside and inside they had a huge area set up for the babies. Here is Autumn with a bottled filled with misc. items. She loved it when I rolled it across the floor to her. Autumn is also wearing one of her new dainty lace headbands along with an itty bitty bow from Prissy Miss Boutique. They also had a broomstick laying on two chairs with tons of ribbons and bows tied to it. We all know Miss Autumn loves strings, so she was in heaven with these goodies! They had these really neat clear plastic bags filled with water and other misc. items that were floating in the water (confetti, birthday candles, etc). Autumn loved smacking the bag with her little hands. It was really neat because while I was in the baby room, there was another mom in there with her little girl and she was a Nov. 20th, 2008 baby and Autumn is Nov. 21st! Her daughter had really long hair already, I couldn’t believe it. Autumn just loved her and was copying her- if this girl pulled up, Autumn had to pull up, if she sat down, Autumn sat down. They shared toys and crawled after each other. I thought this was a neat idea, they had wipe containers filled with strips of bandanas in different colors. I thought Autumn would be all over it and would be pulling the strips of fabric out, but, oh no, she just wanted to open and close that lid! We went outside to see the big kid stuff, but there was not much Autumn could do so we went back to the infant room. They had a ‘baking a cake’ area, we made a birthday hat, and face painting. I thought she was just a little to young for face painting- heheh! 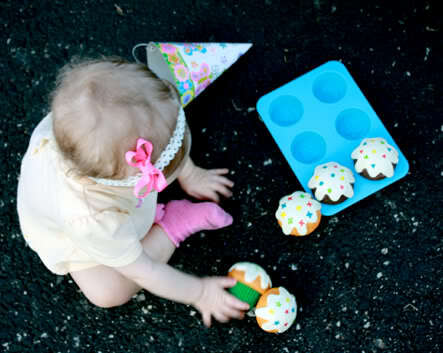 Here is a picture of her playing with some cupcakes on the parking lot next to the table. I was a little bummed the outside part was in the parking lot instead of in the field this year. I have no idea why they did that but it made it so I couldn’t set Autumn down to look at things because she’d try to crawl and I didn’t want her to scrape her knees. But, the baby area was worth the trip out there! I can’t wait to go next year! I am a little bummed I didn’t get pictures of Nathan attending it this year, but I guess there is always next year.